What better combination than banana, chocolate and peanut butter? Mmmmmm Good! 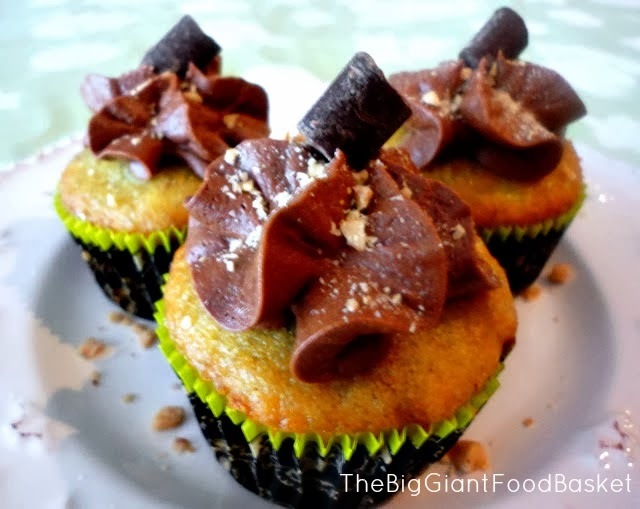 The cupcakes are banana and the frosting is made with both chocolate and peanut butter . Then I topped them off with some toffee dust and a single chunk of semi-sweet chocolate. I named them after my son Michael who I've nicknamed "Monkey Boy" because of the way he can climb! Prepare the muffing tins by lining them with your paper muffin cups. In a large bowl, cream the shortening and then add the eggs beating well after the addition of each egg. Beat in the banana and the vanilla until blended. In a separate bowl mix together the flour, baking powder, baking soda and salt. Then place the flour mixture into a sifter and begin to sift it into the banana mixture. Blend and then add a little buttermilk and keep alternating the wet and dry ingredients until they are all gone. Spoon into your muffin cups until they are 2/3 full. Place cupcakes into a preheated oven of 350F degrees and bake for 16-18 minutes. remove from oven and let cool before frosting. Cream the butter and then add the cocoa, vanilla and peanut butter and blend. Then alternating the sugar and the milk begin to add until all ingredients are gone. Take the Heath bits and place in plastic bag and with a rolling pin crush the bits into much smaller pieces. 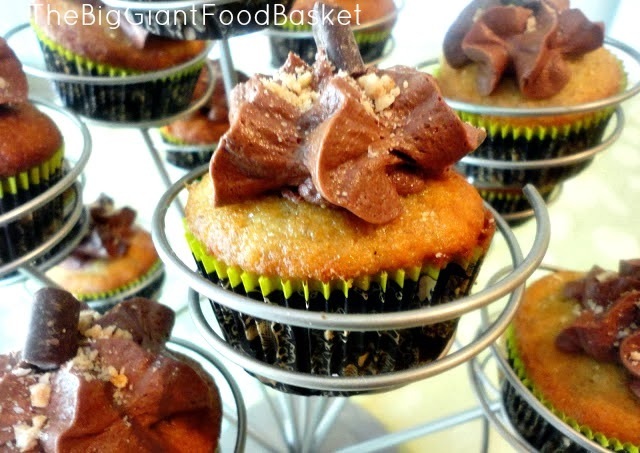 Sprinkle Heath dust over the frosted cupcakes and top with a chocolate chunk. Makes 18 regular size cupcakes!